We drove past this place while we were out strawberry picking last weekend in the Lanaudiere region north of Montréal. It’s hard not to notice a weathered old barn with a tin roof and some lovely blue doors, so I just had to double back and snap a few shots. 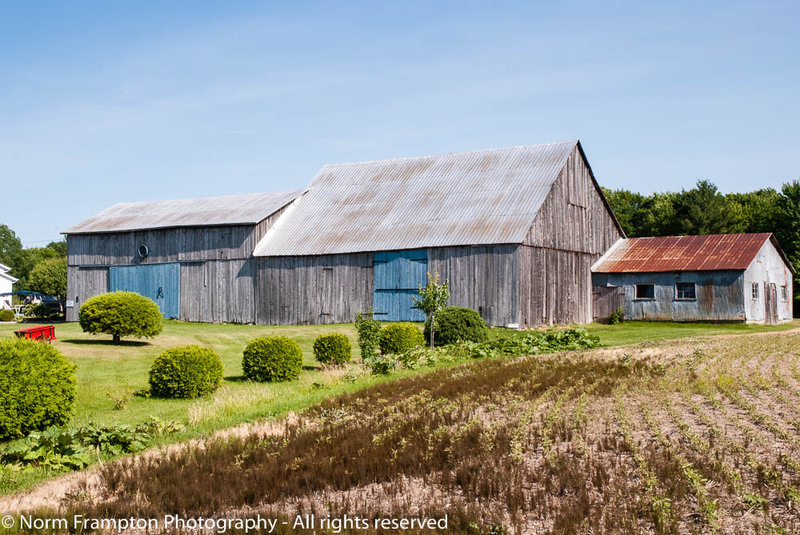 Gallery | This entry was posted in Photography, Thursday Doors and tagged Barn, Canada, Doors, Farm country, Lanaudiere region, Québec, strawberry hunting, Thursday Doors, Tourism. Bookmark the permalink. I enjoyed this serene scene and am happy I am catching up with posts I missed or didn’t have time to comment on, Norm. Thanks for the kind words. We went exploring this past weekend and found a few more that will appear in future posts. I love that door – so much fun!!! Great find; those blue barn doors are visually outstanding! love the blue – so much more striking than the traditional red ones I usually see. Thanks. I thought it made for a nice change. Norm – those are lovely blue doors – and although weathered – they are still in good shape…. Thanks, they do seem to be reasonably well-maintained despite their age. The blue doors. Clean and simple. I also like the barns with the bushes and tilled land. Nice variety. Norm isn’t that something with it’s accent colour? Love the flaming red cart as well. That was well worth turning back for! Hi Norm and friends, Check out more doors from Paris here! I love those barn doors. Lovely image and colours, and I also really like the red wheelbarrow! I wanted to make it a bigger part of one of the shots, for the contrast, but this was the best I could do without trespassing. Nothing like a barn door. I love them. I know what you mean Jan. There’s something special about a nice old weathered barn. Thanks for the kind words Joey. We went driving around the countryside and found a few more nice ones yesterday. They look like they could be in a children’s storybook. The Barn Family with Mama, Papa and the little red-headed offspring to the side. Great shot, Norm and I love those blue doors. Hey thanks Jean, I think you just gave me an idea for a childrens’ book! How ever do you find such wonderful places? I would love to know the story of how the doors became blue. I am glad you gave us three photos. I really loved your close up, and the distance photos to give me a sense of the setting. 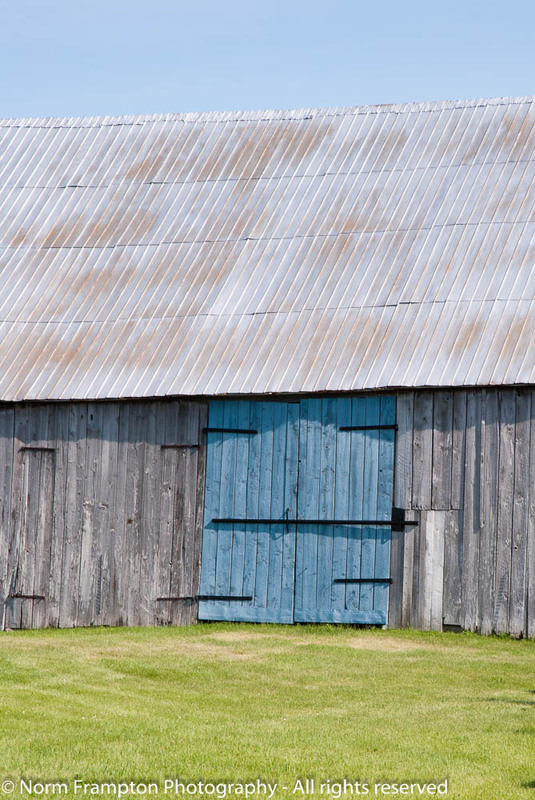 I didn’t not realize at first that both barns had the blue doors. That makes them even more special. 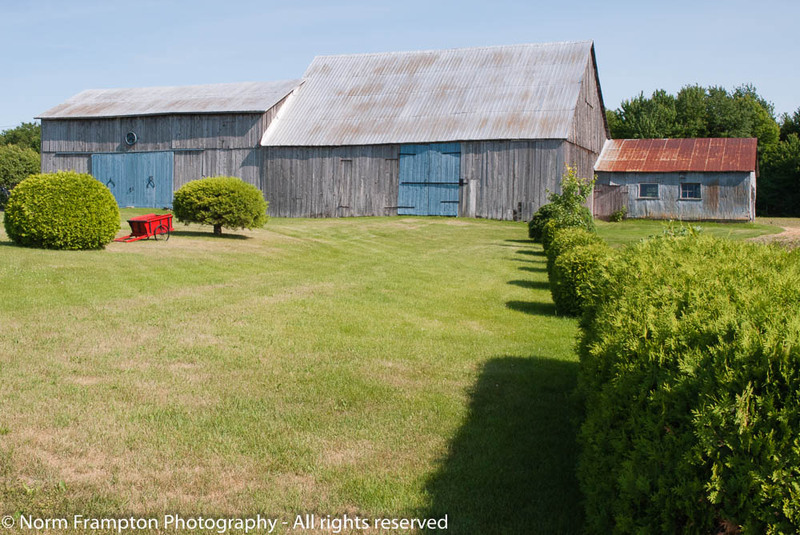 Fresh strawberries, a well-kept farm, and a barn with blue doors. Life is good! I love the blue doors Norm. That barn tells a story. It looks to have grown over time. The grounds around it look to be in wonderful condition. It seems like it would be a good place to spend some time. Thanks Judy. We were out scouring the countryside for more barn doors and strawberries yesterday too. It was a fruitful outing on both fronts. I love these blue doors Norm. Barns always seem to have an aura of history about them. You will have to search for more.